Nobody really wants to eat these just because they think they taste good. I have come to the conclusion that it is a sport of men...so-to-speak. Who can eat the most without passing out? Well my husband loves a spicy challenge. He believes his stomach is made from steel (far from it...I mean like really far...miles far from it), and he has been begging me to buy him habanero jam. Well I can't ever find any, and since I successfully canned Rhubarb Strawberry Jam, I figured I could give it a whirl and try canning hananero jam. Thus the creation of Habanero Pineapple Jam! I will admit that I haven't been brave enough to try this one. It is colorful and beautiful though! If you wanting to try a recipe with some kick to it, here it is. I created this over the weekend and it set up perfectly! Spread it out over a block of cream cheese, and enjoy with some butter crackers (like Ritz). Vent your kitchen. Turn on the hood range, open the windows, turn on the fans. It makes the air spicy! 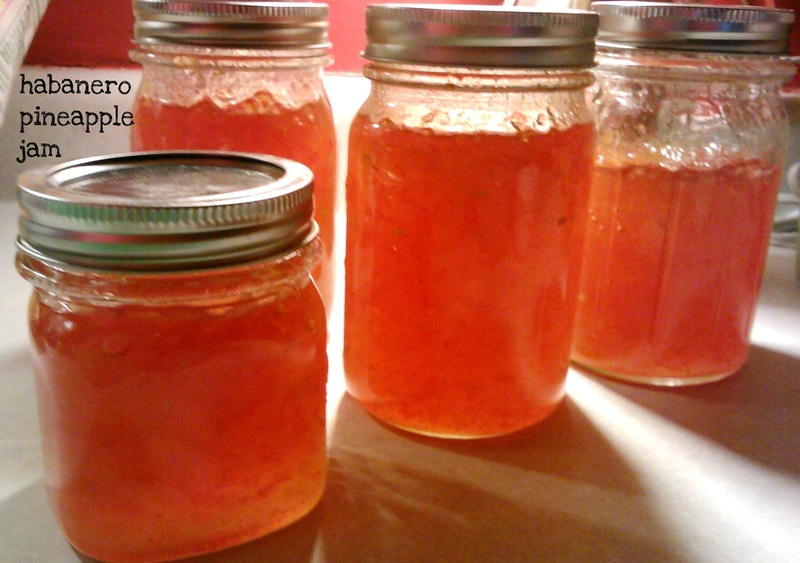 Wash everything promptly after making the jam, so it doesn't spread the spiciness onto other surfaces. Sterilize jars and lids in simmering water. In a large saucepan pour white sugar and apple cider vinegar together. Cook over a medium-high heat until sugar is dissolved. Bring to a boil; let boil for 5 minutes, stirring occasionally. 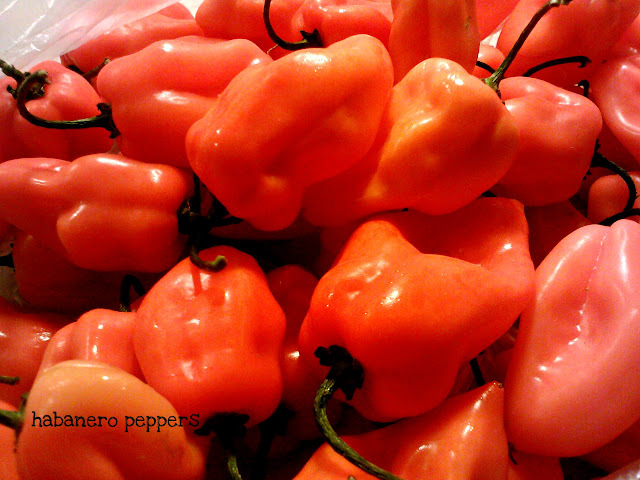 While mixture is boiling, add habaneros to a food processor to finely mince. Add minced peppers to the boiling sugar mixture. Stir well; add the drained crushed pineapple. Bring back to a rapid boil. Boil for 3 minutes; stirring constantly. Add powdered pectin one tablespoon at a time; mixing well after each addition. Let boil for 2 minutes. Seal and place ring on. Let set for 10 minutes, turn upside down (I do this on a dish towel) and let set for half an hour, then turn right side up again. This should vacuum seal the lids.